where is the elemental tag???? Hearthpwn likely didn't update the card art. As he does have it in game. So is there any use for this guy now that Megafin exists? I've been on the verge of dusting him for the past couple days. I can't see a reason to keep him around anymore. It probably costs just as much to pop the quest as it does to get this fatty out there. Hmm. Okay yep, just decided. Definitely disenchanting him! 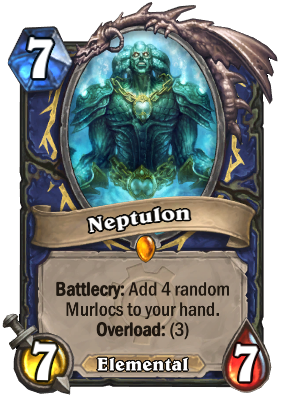 Getting ready for your new friend Megafin, Neptulon! how did i think that his attack said true-bottom? true-bottom and pure water aren't even close to similar..
Best Legendary entrance music ever? The only way now is to craft him. Is this worth the craft? Im not too sure now with the 1/1 and 1/3 murlocs coming out of LOE, idk any thoughts? If you play Murloc Shaman, 100%. The chances of getting good murlocs is still pretty high and getting an extraOld Murk-Eye is a great finish. If you play Shaman, solid 60-70%. He's a good 7 drop but Dr.Boom is almost always better. If you don't play Shaman much I wouldn't bother.